The thin appears when the golfer fails to get the leading edge of the club to the bottom of the ball. Instead it makes contact halfway up the back of the ball, which results in the ball running along the ground. This particular shot pattern is common to the beginner. The one thing they want to do is to get the ball up into the air. Ironically, it’s the scooping action this desire generates that causes the ball to bumble along the ground. Contrary to what most people believe, a top shot is rarely caused by the old adage of “you lifted your head”. 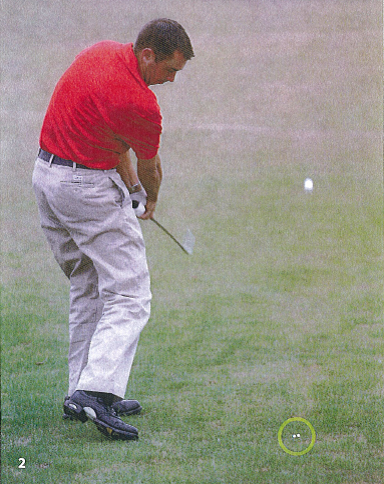 The main reason for this particular shot is that the golfer tries to lift the ball into the air, the club rising as it meets the ball. 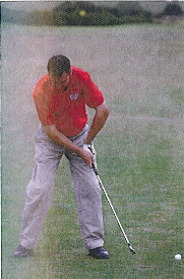 This tends to make their left arm buckle as the club approaches the ball, narrowing the swing radius. The club swings upward, shortening the swing arc that was established at set up. 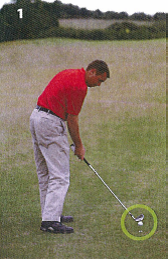 A great practise drill is to hit balls on the range with an object 12 inches behind the ball (fig 1). It could be anything, a tee peg or a pencil for example. With an object behind the ball, your attention switches to making a sharper and steeper angle of attack – you don’t want the club to smash into the pencil. This creates a more downward blow, the club striking ball then turf (fig 2). This is the ideal contact for pure, well-struck iron shots – and for ditching that top/thinned shot. I hope you enjoyed the article, any comments or Questions then please leave a comment below..